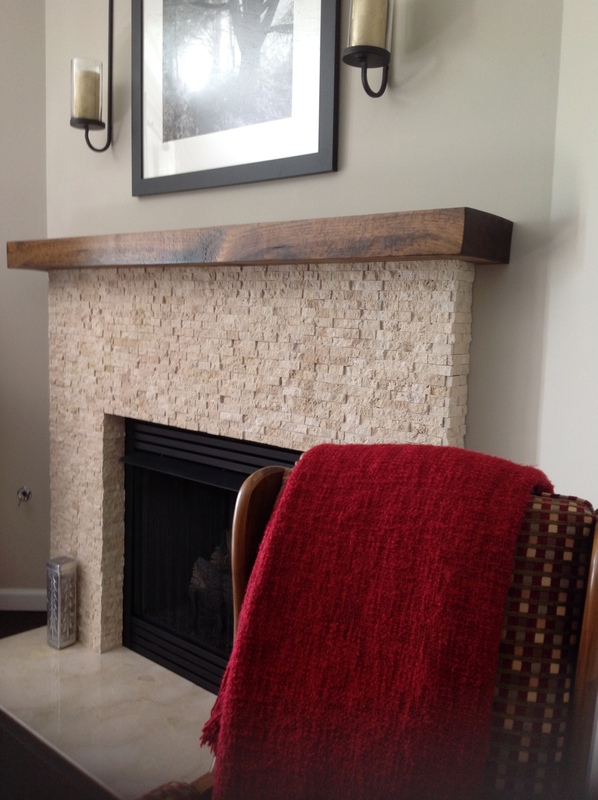 This project involved removing a builder-grade mantle and surround, replacing with split-face stone. The first step was making a SketchUp drawing to help visualize the concept. This also helps greatly in fixing dimensions. SketchUp is a Google CAD app that uses exact measurements to create a 3D model which can then be scaled, rotated, exploded, etc. A professional version can be purchased, but I use the free version – it’s very powerful and has everything that I need. There is a learning curve associated with it, but there are plenty of instructional videos on the web. Next I removed the old mantle/marble surround and repaired the resulting wall damage. Using measurements from the drawing I was able to construct a frame to project from the wall. Next I covered the framework with backer board and over that I installed split-face stone sheets that I purchased from a local salvage outlet. The mantle is a piece of timber that I bought from a mill in Pigeon Forge, TN, stained with Minwax Provencial, finished out with 3 coats of satin polyurethane. The mantle is attached to the frame with 2 large construction screws. The holes were plugged with dowel pins and stained to match the mantle.